My first school was Elysian Street Primary. I went there from 1941 to 1947, and my memories of it are patchy. I remember my first day. Harry Gibbons lived next door to me and was 18 months older, so he had been at school for one year when I started. He took me there, saw me to the Standard 1 classroom, and then left to go Standard 2. I was unprepared for being left alone in this strange environment, howled, and cried my eyes out. The headmistress when I joined was Mrs Baskerville, a kindly person, who must have been at the school for some time, because she remembered my brother, who also attended Elysian St, but was seven years ahead of me and had left by the time I started. She was replaced soon after I started by Miss Hollerton, altogether stricter than Mrs B. Miss O’Hara was the nursery teacher, Miss Dawson played the piano at assembly, Miss Woodruff (spelling) taught me in standard three, I think, and my final teacher was Miss Hitchcock. Other than those, I have trouble recalling any other teachers’ names. After all this time, the only classroom memories I have are of the joint chanting of our times tables, the whole class in unison. Learning by rote was very unfashionable for a long time (and might well still be), but learning my times tables has stood me in good stead all my life. We used to do a lot of composition, writing short stories, presumably to check our knowledge of grammar and spelling. Art was mainly pencil drawing, I think, and came round very regularly. My drawings were boringly predictable, pretty well all of them were incidents from football matches. In the final year, Miss Hitchcock used to finish the day with a chapter from Swallows and Amazons, a book that I and a lot of other kids found to be wonderful. A great escape to a magical world of young boys and girls enjoying adventures out of the reach of adults. And in the Lake District, so different from Openshaw that we had difficulty imagining it. It lit a keen interest in me of Arthur Ransome’s books and of sailing in general. Strange that a child from a very working class background should have related so strongly to tales of middle class public school children. In the final year I sat next to a boy called Peter Case and can remember playing many games of a book based game of cricket. Each letter of the alphabet was assigned a number for the batsman’s runs for each stroke, and some letters meant the batsman was out, “b” meant bowled, “c” was caught, and so on. Peter would open a book at random and start to read out the runs and the wickets. As he was the best at remembering the rules ( I think he might have invented the game), he did the reading and I did the scoring. When one innings was finished he turned to a new page and we were off again. Well, we had no computer games. The school hall was the major room in the school, with the classrooms arranged around it. The lavatories were outside, across a small playground alongside the school building. Asking teacher “please can I go across the yard, miss?” was a way of breaking up the lesson. 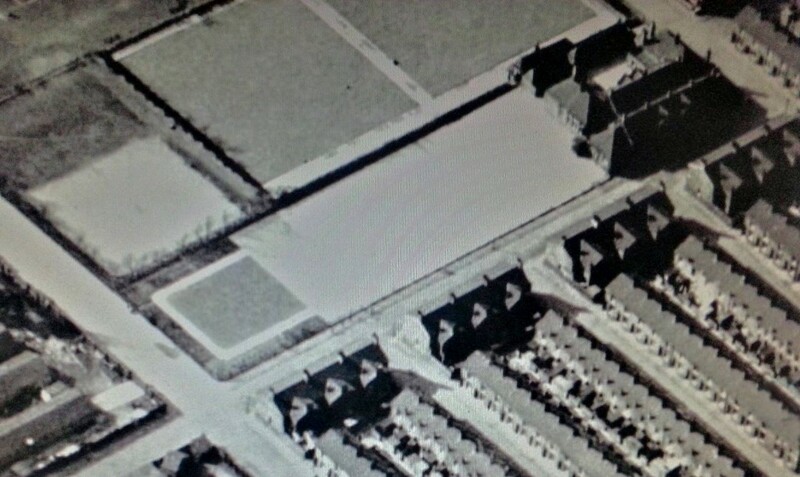 The main playground was in front of the school, it had a large level part alongside Elysian St, and a sloping piece falling down to George St park, now Openshaw park. We played football every dinner time on the level bit, using a tennis ball for a football. The sloping part was great in the frost and snow for sliding down after we’d polished the ice or snow with our boots. I wore boots for pretty well all my primary school life, but some kids came in clogs, with leather uppers and wooden soles complete with metal studs. Clogs were great for ice slides in the playground. Further from the school was a garden with a path leading round it. Between the path and the fence, flowers were grown. Inside the path was grassed over, but I think we were probably not allowed to walk on this. We kids firmly believed that the garden had been the site of an earlier school, made of tin. If there was any truth in this, I suppose “tin” must have meant corrugated iron or similar. Whenever a piece of metal was unearthed in the garden, it confirmed our belief about this earlier tin school. Our school football and cricket teams played in George St park, which had a shale surface, very good for skinning knees. I know we had some kind of school orchestra, because I played the triangle in it, having no other musical aptitude or training. We also had a choir, but I was told to move my lips but not make any noise. A bit cruel in retrospect. We also put on some plays, possibly at Christmas. I was given a part in one of these, but made a mess of things by insisting on reading out my character’s name, as well as the words he was meant to say. It took me some time to get the hang of this, but I would have been awful anyway, as I was quite shy as a child and would have hated performing in from of an audience. 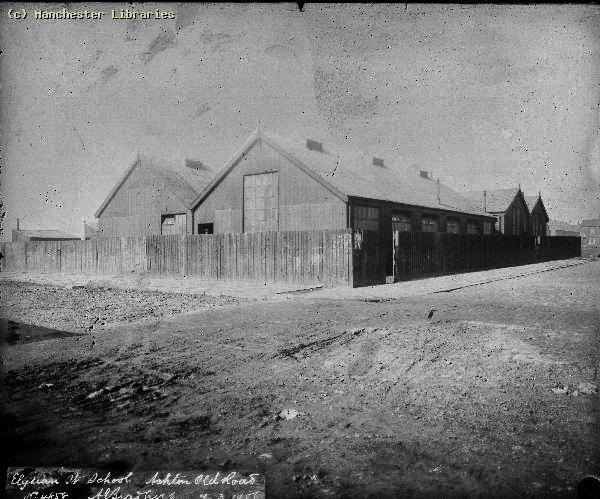 School was about a half a mile away from home, across Ashton Old Road, a major road to the east out of Manchester. From the age of 5 I used to take myself to school, across that road, and as I went home for dinner, I crossed the road four times a day, for six years. Traffic was a lot lighter in those days, but even so it was not something that would be tolerated these days, parental neglect would have been the accusation. Life was a lot simpler then, and I think that people in general were not as aware of problems, or perhaps they didn’t exist as they do now, or as we believe they do now. Being part of a closely knit homogeneous neighbourhood made for a safer environment, and people travelled less, so strangers were more obvious. These were the days of the eleven plus exam, which determined whether you went to a high school or a secondary modern, I passed to go to high school, so my education in Openshaw finished in 1947. The majority of pupils from Elysian St went to Wheler St school, near Fairfield Rd. As the law at the time said only that you had to attend until 14, most pupils only had three years at Wheler St before leaving for apprenticeships or other on the job training. It seems strange and harsh that kids as young as 14 could be shunted out into the adult world of serious work. The only other Openshaw school I know about is Varna St, which was both a primary and secondary school. Some of my pals at high school went there, but otherwise I know nothing about it. Elysian St school was pulled down some time in the 1980s. I’m not sure I understand why, as it was a very solid building, so I can only assume that it was victim of the demolition of Openshaw and the reduction of numbers of potential pupils. Or maybe some misguided council policy of amalgamation and efficiency. I can’t honestly say that I remember my days at Elysian St as some kind of super happy time, but a lot of that is due to the fact that it was a long, long time ago, and the memories are now blurred. I have no memories of its not being enjoyable, or of being reluctant to go. It had no bullying that I remember, and no serious fights that I can recall. The teaching staff were nice, friendly and not overly strict, so my time at Elysian must have been a happy one, and a good start to my education. I can only find two pictures of the school. This one is obviously very old, and I can’t decide where it was taken from. squares are bowli ng greens in George St park. This was the form photo of my last year, 1947. Teacher was Miss Hitchcok, and I’m third from the left on the back row. A big class with 38 kids. I can put names to about a third, which isn’t bad after all this time, and I never saw any of them after 1947. This is confusing. I have a list of streets in Manchester and Salford, that lists Orr St as being in postal district 11, Openshaw, Clayton, Beswick, but it’s not listed in a 1941 Geographia map of Manchester. You might want to ask on the Openshaw Facebook page https://www.facebook.com/groups/6549572185/. It has a lot of postings of photos of Openshaw before it was redeveloped, and has a lot of people reading and following. It’s a closed page so you have to ask to join, but that’s a formality. You clearly have a very good memory, you can remember more kids from my class than I can. I think I must have been milk and ink monitor at some time but can’t remember. I can remember those double desks with the inkwells and scratchy nib pens. I didn’t appreciate that the picture of the school was the old (tin) one, but if it was the corner of Elysian and North Streets, it must have been. A lovely report Derek on Elysian St. as you remember it. I have pretty much the same memories as I was there from 1939 to 1945 just two years above you. I remember all the teachers you mentioned especially Miss Woodruffe, for some reason I was afraid of her.Then there was Miss or Mrs. Naylor, an eccentric old dear and a very young attractive lady called Miss Livingstone who we all fell in love with until she got married and became Mrs. Twist. My Dad went to the old tin school that you mentioned, he was born in 1907 so if he stayed there until he was fourteen he would have left in 1921. I cannot find out when it was knocked down and the new one (ours) was built. Your photo would have been taken from the corner of Browns yard, the road leading to the left is North st.(later Parkside st.) and the other is Elysian St. 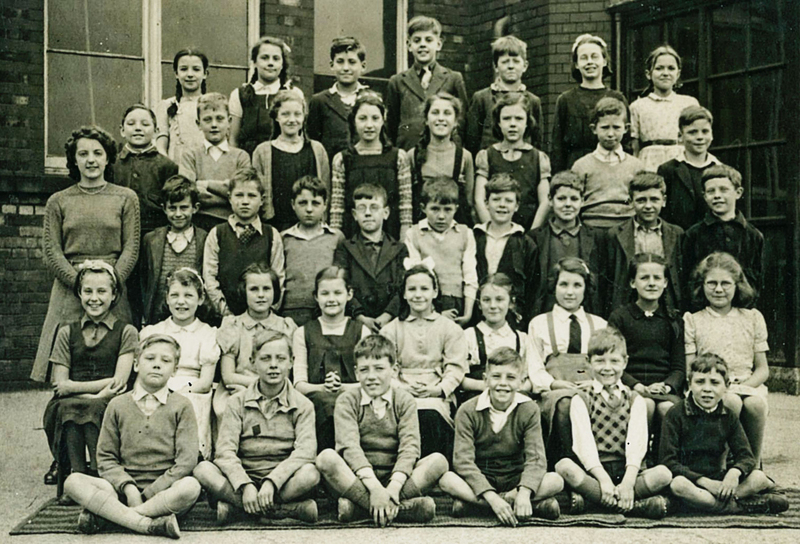 I remember all of the pupils that you mentioned and can put a name to a few more faces.The first girl top row could be Sylvia Dollimore. Tony Mills is next to George McCarthy. Alan Morgan is third boy down from Miss Hitchcock. Looks like George Lewis 4th boy from left sat down next to Alan Hooley. The girl behind George looks like Beryl Cox. and the boy behind the teacher and next to Keith Stansfield could be Derek Ford from the Farm shop. I remember Arthur Bailey of course, we have exchanged a few emails over the years but not recently. His dad Arthur used to run our local kids football team. He was in the RAF during the war but also played for Oldham Athletic. Maybe David could confirm that. That’s all for now Derek, the old grey cells have been working overtime to remember all that. Have a good New Year, all the best……Alec. how lovely to read your story derek of a such a good school. thanks for sharing it.